When it comes to your wedding, if you had a nickel for every time you heard the phrase "It's About Time" you'd likely have close to a buck. Or maybe you are the dad of the bride who's been hoping for this moment forever. Well this quote coolie is a funny that features the "It's About Time" phrase on the front of the wedding coolie and your personalized wedding message on the back. The "It's About Time" text features a playful font that could have been pulled off of a movie ad and the back can be customized to show the exact messaging that you want. Choose from 25 different koozie colors and 25 printing colors so you can have the perfect wedding favor that will draw laughs for years and years to come. So stop reading this as "It's about time" you pick up this perfect wedding favor! I ordered 275 koozies 2 weeks before I needed then in my hands and they had then here in a weeks time. 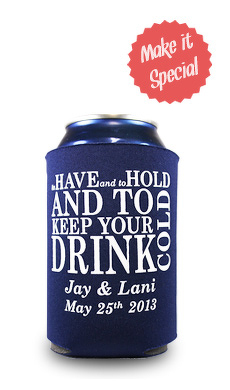 They helped me create a koozies that fit the couple as well as the wedding theme. Beyond that the quality of product was hands down the best I've seen in a long time for what I paid! I highly recommend both this product as well as this company! The koozies came in a timely fashion and looked great. Cannot wait to give these out to our wedding guests and friends!